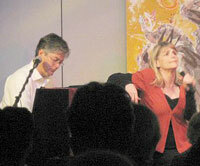 Broadway veteran Nancy Johnston and musical director Doug Coates in a concert cabaret. "When the houselights dimmed on Saturday night over a full house at the Cultural Center on Lake Carmel, a thunderstorm raged outside the theater while Doug Coates and Nancy Johnston took the stage in a cabaret style Broadway review directed by Blue Horse Repertory's Peggity Price. From Sondheim to Bernstein to Jones and Schmidt and everyone in between, using advanced lighting cues, complex staging and dialog to connect one number to the next, the storms outside were forgotten by the lightning storm of talent and musical harmony on the stage in what is rapidly becoming our county's most successful theatrical and arts venue. That was until near the end of the first act when lightning struck the building with a flash and a ! CLAP ! 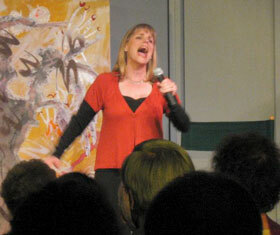 that set our ears to ringing - but the performers and crew never missed a beat. The audience laughed, and the audience cried, and, in the second act when Mr. Coates performed the piano arrangement of George Gershwin's "Rhapsody in Blue", they cheered. At the end of an encore, "Glitter and Be Gay" from Leonard Bernstein's excellent, yet under appreciated theatrical version of "Candide", the audience erupted from their seats giving soprano Nancy Johnston a long, enthusiastic and well deserved standing ovation which over shadowed the raging storms outside."